The Syrian refugees’ migration to Europe became important event; it understood as the crisis for the European countries especially when it started in 2015. Media has been playing important roles to affect the readers’ perception of the topic but also shapes the government’s policy. Every news in the media has specific frames written by the different authors but also has general frame representing the newspaper’s own positionality affecting the perception of the refugees by its readers. 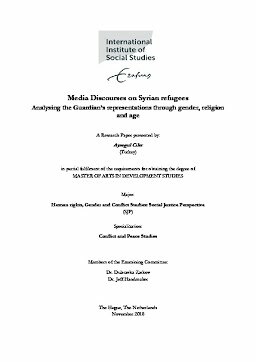 In this research, I analysed the Guardian newspaper’s news from 2014 to today, with focusing on both visual and textual sources. I looked the role of age, religion and gender in refugee representations with intersectionality approach. From Securitization and Orientalism perspective, there is a strong binary representation of refugees as either invaders who came to Europe to take jobs from its citizen, to change their culture and bring security threat as potential terrorists; or showing them as the vulnerable and weak, and put them in a pitying, victim position. In the Guardian representation of women and children were similar and almost every news item about children’ vulnerability. This may be to get attention to policy makers for policies needed to provide necessary conditions for refugees, or to get attention from the public to help and accept refugees. Male refugees in the newspaper represented as non-aggressive and likable with their individual stories. The male refugee is represented in the solidarity with other refugees and they can be in the positive role to awake sympathy in the UK media to change negative perception and to resettle more refugees. As Yazidi women; being sexual slave to ISIS is written with binary representation of non-Muslim women vs Muslim men with history of full of persecution from their Muslim rulers. On the other hand, being Muslim or non-Muslim women in the conflict has same framing in the sense of difficulties they face from war and from their culture as conservative and patriarchal.